Important: This is our old site *archive* and is no longer live (prices and inventory are outdated and not valid). Please visit https://betterthandiamond.com directly to view our new site with live shopping. For those considering a simulant that combines the sophistication of the Asscher cut, but with the rarity of a realistic fancy yellow, our new canary Asscher cut may be the Asha of choice for you. We've worked hard to ensure our yellow Asha Asschers are the most natural looking Canary yellow diamond simulants available. Combining a pure even yellow saturation along with our highly regarded diamond-infusion process, the result is a yellow that stands apart. A note about Natural yellow diamonds: Natural yellow diamonds are quite rare, with some experts noting that there is roughly 10,000 white diamonds to every 1 yellow diamond. Thus, yellow diamonds have become a favorite among the jet-set crowd as a further way to set themselves apart from the ordinary. 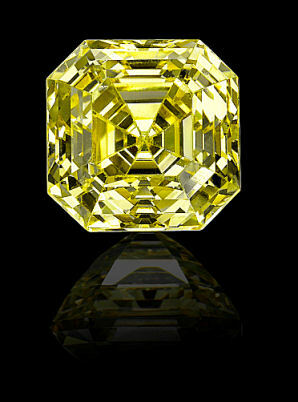 Fancy Intense yellows of larger sizes can command prices up to $20,000/ct. Just something to keep in mind if you are not planning to reveal the source of your new 'canary diamond'. Please note that this page is for our Asha Diamond Simulant yellows. For true lab grown yellow diamonds, please see our Takara website here. Like our colorless Asha's, the clarity and polish on these are all top notch - internally flawless clarity and excellent polish. Fast shipping: Our fancy yellow Asscher's ship in diamond paper packaging, and usually ship within 48 hours of your order. We will email you the UPS tracking number when it ships, and 2 day UPS shipping is free for orders over $200.